The eye is a marvelous, but complicated, part of our bodies. As you age, a variety of problems with vision may arise. These problems fall into two classes: problems that can be corrected with glasses or contacts and problems that can’t be. If your vision can be corrected with glasses and contacts, your problem is called a refractive error, and we can usually get rid of your glasses and contacts with the appropriate surgical procedure. Refractive errors are focusing problems in the eye. If glasses and contacts don’t correct your vision, you have a bigger problem, and you may need a different kind of surgery, such as cataract surgery. If you have cataracts, you might want to consult my book, Cataract Surgery: A Patient’s Guide to Cataract Treatment. The book you are reading now is mainly concerned with the first class of problems, refractive errors, and how to correct them permanently. Figure 2. Normal vision. Light from an object comes to a perfect focus on the retina. How well you see is determined, for the most part, by how accurately your eyes are able to focus, or refract, light. In a normal eye, the light that enters the eye is refracted to a precise point on the retina (Figure 2). Unfortunately, this precise focus often does not occur. The result is various forms of blurry vision due to refractive error. If you have a refractive error, you need glasses or contacts to see clearly. There are two basic types of refractive error: myopia and hyperopia. Each of these can occur alone or in combination with astigmatism. Also known as nearsightedness, myopia is a condition in which you can see nearby objects clearly, but objects at a distance appear blurred. This happens when light reflecting from a faraway object enters the eye and comes to a point of focus too soon, before it reaches the retina (Figure 3). Myopia may be due to any one of three causes. First, the cornea may have too much curvature, which causes the light to bend too much and focus in front of the retina. Second, the lens may be too strong, again focusing the light too quickly so the focus occurs before the retina. 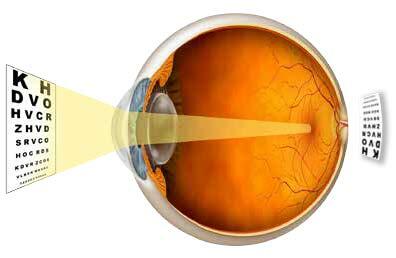 Third, the eyeball can be too long—the retina is too far back for the combined focusing power of the cornea and lens. Each of these three possible causes of myopia results in light coming to focus in front of the retina. Figure 3. Nearsighted vision (myopia). The focusing power of the cornea and lens is too strong, so light from an object is focused in front of the retina. The result is blurry vision. In general terms, nearsightedness can be corrected surgically in two ways: either move the retina forward toward the front of the eye, or move the focus of light back toward the retina. The retina can be moved forward by resecting a strip of sclera around the equator of the eye and sewing the remaining front and back halves of the eye back together. This operation was invented in Russia and is risky, so it has never been done in the United States (fortunately). The other method is to reduce the focusing power of the front part of the eye so that the focus of light moves back to the proper spot on the retina. The focusing power of the front part of the eye can be reduced in a few ways. We can reduce the power of the cornea by flattening it out. This is how LASIK and PRK surgeries correct nearsightedness. Another option is to replace the lens of the eye with a synthetic lens that has less focusing power, a procedure called refractive lens exchange (RLE). A third option is to insert a tiny contact lens in front of the natural lens to subtract focusing power. This is called an implantable contact lens (ICL) and is suitable for highly nearsighted people. Figure 4. Farsighted vision (hyperopia). The focusing power of the cornea and lens is too weak. 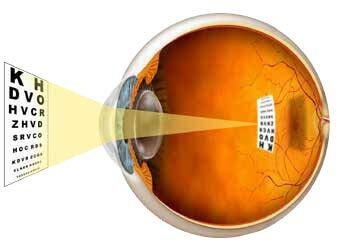 Light from an object is focused behind the retina, causing blurry vision. People with hyperopia, orfarsightedness, see close objects blurry when they are young. As they age, distant objects get blurry, too, but not as blurry as close objects. In hyperopia, the light rays coming into the cornea are not bent sharply enough and are focused behind, rather than on, the retina. The result is a blurred image (Figure 4). Like myopia, there are three possible causes for hyperopia. First, the cornea may not have enough curvature, which causes the light to bend too little and focus behind the retina. Second, the lens may be too weak, again focusing the light too weakly, so the focus occurs behind the retina. Third, the eyeball can be too short—the retina is too close for the combined focusing power of the cornea and lens. Because the lens is very elastic in youth, younger people who are mildly hyperopic can often compensate for it by using the focusing muscles around the lens to fine-tune the focus by bending light more steeply. This action brings the point of focus forward toward the retina, allowing them to see more clearly. However, because the muscles weaken and the lens becomes less pliable as we age, these individuals eventually lose that ability and may no longer see well at a distance or close up. After age forty, they may be completely dependent on eyeglasses or contact lenses for both close and distant vision. Farsightedness can be corrected surgically in ways similar to nearsightedness. The focusing power of the cornea can be increased with LASIK or PRK, so that the focus of light moves forward onto on the retina. Refractive lens exchange, in which the natural lens is replaced with a stronger synthetic lens, is often an excellent option. The new lens can be multifocal, which restores both distance and reading vision. The implantable contact lens can also be used, but is not approved in the United States for that application. Many individuals with myopia or hyperopia also have some degree of astigmatism. People with significant astigmatism experience blurred or distorted vision with all objects, whether near or far. Astigmatism means that your cornea, instead of being spherical like a basketball, is slightly oval, shaped more like the side of a football. As a result, light rays entering the eye from different points on the cornea’s surface are bent differently and are focused at several different points rather than meeting at just one focal point. Astigmatism can also result if the lens of the eye is oval instead of round. Astigmatism, by itself or in combination with nearsightedness or farsightedness, can be corrected with LASIK or PRK. To correct astigmatism with LASIK or PRK, the laser removes an oval-shaped area of tissue instead of a round shape. Astigmatism can also be corrected by making tiny incisions at the periphery of the cornea. These are called relaxing incisions, because they allow the oval cornea to relax outward and become spherical. Astigmatism can also be corrected with refractive lens exchange by implanting a lens that has built-in astigmatism correction. These lenses are called toric lenses.